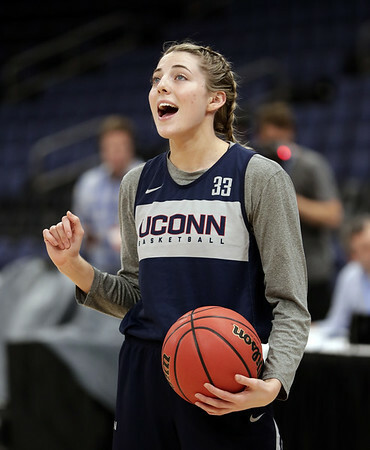 TAMPA, Fla. - Katie Lou Samuelson’s senior season was as much a grind for her as it was for the UConn women’s basketball team. But like the Huskies, the Huntington Beach, California, native found herself on a familiar stage on the final weekend. Samuelson was named to the 10-player Women’s Basketball Coaches Association All-America team, introduced at Amalie Arena on Thursday. Also selected was teammate and classmate Napheesa Collier, who picked up the Katrina McClain Award as the nation’s top power forward. Samuelson entered last night’s national semifinal with Notre Dame averaging 18.5 points, a career-best 6.5 rebounds, and 3.8 assists. But while her overall play has been solid, she has not shot the ball as well as she would want or expect. What may have gotten her over the top and on to the WBCA team was her 29-point performance last Sunday in the Albany Regional final win over Louisville that got the Huskies into the Final Four. She became the 13th UConn player to be named to a postseason all-tournament team in all four of her seasons when she was placed on the all-regional squad. Samuelson is the fifth UConn player to be named to the WBCA at least three times, joining Svetlana Abrosimova (1999-2001), Diana Taurasi (2002-04), Maya Moore (the only four-time selection, 2008-11), and Breanna Stewart (2014-16). She is fifth on UConn’s all-time scoring list with 2,322 points and second in 3-point baskets with 379. Collier was selected to the WBCA team for the second time, having been so honored in 2017. The 2019 American Athletic Conference Player of the Year and the Most Outstanding Player of the AAC Tournament and Albany Regional was averaging an AAC-leading 21.0 points on 61.5 percent shooting from the floor, 10.8 rebounds, 3.6 assists, and 1.6 blocked shots. Her 777 points on the season entering last night’s game was tied for second with Stewart and her 398 rebounds is a school single-season record. She is in the top five all-time at UConn in points (third at 2,386), field-goal percentage (third at 61.6), and rebounds (fourth at 1,206). The St. Charles, Missouri, resident was a finalist for the inaugural McClain Award last year before accepting the award from the Naismith Hall of Famer Thursday. “I felt really honored that she felt that I was worthy to get her award,” Collier said. Posted in New Britain Herald, UConn on Friday, 5 April 2019 21:20. Updated: Friday, 5 April 2019 21:22.